Dr Freeman's doctoral training was at Bristol University, under the supervision of Tom Troscianko, where in 1998 he gained a PhD in Psychology. He then worked as a postdoctoral research fellow with Jon Driver, in the Institute of Cognitive Neuroscience at UCL, until 2007. During that period he travelled to the Weizmann Institute to work with Dov Sagi in Israel, and to the Smith-Kettlewell Institute in San Francisco to work with Preeti Verghese. He was also a visiting fellow at Salk Institute in San Diego, in Geoff Boynton's laboratory. After his postdoctoral training, he took a lectureship at the Psychology Department at Brunel University, before moving to his present post here at City University London in 2009. In his early research Dr Freeman developed a paradigm for investigating how attention and task demands can influence visual contour integration, a fundamental process by which the visual brain integrates its fragmentary input into global forms. His theme has since broadened to studying how the brain resolves the interpretation of ambiguous stimuli, according to the context in which they are encountered. He has found that such context interactions can be gated (effectively switched on or off) by voluntary goal-directed attention, sometimes with dramatic consequences for subjective awareness. More recently Dr Freeman has been studying contextual interactions between different modalities, such as vision and hearing. For example, he has discovered that the pure timing of auditory events can influence the perceived direction of ambiguous visual apparent motion. 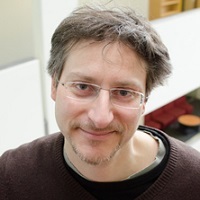 He has also been involved in collaborations on numerical cognition, for example examining interactions between the processing of time, number and space. His current research adopts an individual differences approach, focusing on how people differ in their ability to put sight and sound together. For example, some people lip-read better when lip-movements are slightly delayed relative to voices, while others benefit from a slight auditory delay. His methods are primarily behavioural (psychophysics), but he has also worked on projects involving functional and anatomical fMRI, transcranial magnetic stimulation (TMS) and EEG. He is also beginning to experiment with transcranial electrical stimulation. He is happy to supervise student projects on attention, vision and crossmodal (e.g. audiovisual) integration. Freeman, E. (2005). Lateral interactions between targets and flankers require attention. Neurobiology of Attention (pp. 477–484). ISBN 978-0-12-375731-9. Freeman, E. (2019). Sounds From Silent Motion: Survey Supports Sensory Disinhibition. Freeman, E. and Ipser, A. (2016). Negatively correlated individual differences in audiovisual asynchrony. AVA Xmas 2016 Meeting 19 December, Queen Mary University of London, UK. Freeman, E., Macaluso, E., Rees, G. and Driver, J. (2014). fMRI correlates of object-based attentional facilitation versus suppression of irrelevant stimuli. Ntonia, I., Freeman, E., Joseph, L. and Savva, G. (2014). Response Efficiency: Behavioural Manifestations of an Emotion-led Subjective Experience of Duration. Freeman, E. and Verghese, P. (2010). Peeling plaids apart: Context counteracts cross-orientation contrast masking. Freeman, E.D. and Driver, J.S. (2007). Sound drives visual apparent motion. Freeman, E.D. and Sterzer, P. (2006). Neural correlates of subjective rotation reversals in ambiguous structure-from-motion. Ruff, C.C., Freeman, E.D., Blankenburg, F., Bjoertomt, S., Bestmann, S., Haynes, J.-.D. … Driver, J. (2006). Frontal influences on human retinotopic visual cortex revealed by combining TMS with fMRI and psychophysics. Freeman, E. and Boynton, G.M. (2004). Subjective direction of ambiguous transparent motion is biased by veridical motion of a translucent but not opaque context. Freeman, E.D. and Driver, J. (2002). Attentional modulation of target-flanker lateral interactions: effects of manipulating attention to spatial and non-spatial flanker attributes. Freeman, E.D., Driver, J. and Sagi, D. (2002). Attentional modulation of target-flanker lateral interactions persists with increasing flanker contrast. Freeman, E.D., Driver, J. and Sagi, D. (2001). The strength and specificity of attentional modulation of lateral interactions. Freeman, E.D., Sagi, D. and Driver, J. (2000). Gabor contrast sensitivity depends on task relevance of collinear flankers. Freeman, E.D., Davis, G. and Driver, J. (1999). Visual search for modally and amodally completed regions. Fassnidge, C., Ball, D., Kazaz, Z., Knudsen, S., Spicer, A., Tipple, A. … Freeman, E. (2019). Hearing through Your Eyes: Neural Basis of Audiovisual Cross-activation, Revealed by Transcranial Alternating Current Stimulation. Journal of Cognitive Neuroscience pp. 1–14. doi:10.1162/jocn_a_01395 . Fassnidge, C.J. and Freeman, E.D. (2018). Sounds from seeing silent motion: Who hears them, and what looks loudest? Cortex, 103, pp. 130–141. doi:10.1016/j.cortex.2018.02.019 . Ipser, A., Karlinski, M. and Freeman, E. (2018). Correlation of individual differences in audiovisual asynchrony across stimuli and tasks: new constraints on Temporal Renormalization theory. Journal of Experimental Psychology: Human Perception and Performance, 44(8), pp. 1283–1293. doi:10.1037/xhp0000535 . Fassnidge, C. and Freeman, E. (2018). The Sound of Silent Motion: Converging Support for a Disinhibition Account of Visual-to-Auditory Synaesthesia. PERCEPTION, 47(5), pp. 557–557. Ipser, A., Agolli, V., Bajraktari, A., Al-Alawi, F., Djaafara, N. and Freeman, E. (2017). Sight and sound persistently out of synch: stable individual differences in audiovisual synchronisation revealed by implicit measures of lip-voice integration. Scientific Reports, 7. doi:10.1038/srep46413 . Fassnidge, C., Cecconi-Marcotti, C. and Freeman, E. (2017). A deafening flash! Visual interference of auditory signal detection. Consciousness and Cognition, 49, pp. 15–24. doi:10.1016/j.concog.2016.12.009 . Freeman, E.D. (2016). Individual differences in multisensory integration and timing. Human Vision and Electronic Imaging 2016, HVEI 2016 pp. 25–28. doi:10.2352/ISSN.2470-1173.2016.16HVEI-097 . Cappelletti, M., Chamberlain, R., Freeman, E.D., Kanai, R., Butterworth, B., Price, C.J. … Rees, G. (2014). Commonalities for numerical and continuous quantity skills at temporo-parietal junction. J Cogn Neurosci, 26(5), pp. 986–999. doi:10.1162/jocn_a_00546 . Freeman, E.D., Macaluso, E., Rees, G. and Driver, J. (2014). fMRI correlates of object-based attentional facilitation vs. suppression of irrelevant stimuli, dependent on global grouping and endogenous cueing. Frontiers in Integrative Neuroscience, 8, p. 12. doi:10.3389/fnint.2014.00012 . Freeman, E., Macaluso, E., Rees, G. and Driver, J. (2014). fMRI correlates of object-based attentional facilitation vs. suppression of irrelevant stimuli, dependent on global grouping and endogenous cueing. Frontiers in Integrative Neuroscience, 8. doi:10.3389/fnint.2014.00012 . Freeman, E., Ipser, A., Palmbaha, A., Paunoiu, D., Brown, P., Lambert, C. … Driver, J. (2013). Sight and sound out of synch: Fragmentation and renormalisation of audiovisual integration and subjective timing. Cortex, 49(10), pp. 2875–2887. doi:10.1016/j.cortex.2013.03.006 . Bauer, M., Akam, T., Joseph, S., Freeman, E. and Driver, J. (2012). Does visual flicker phase at gamma frequency modulate neural signal propagation and stimulus selection? J Vis, 12(4). doi:10.1167/12.4.5 . Freeman, E.D., Sterzer, P. and Driver, J. (2012). fMRI correlates of subjective reversals in ambiguous structure-from-motion. JOURNAL OF VISION, 12(6). doi:10.1167/12.6.35 . Leo, F., Romei, V., Freeman, E., Ladavas, E. and Driver, J. (2011). Looming sounds enhance orientation sensitivity for visual stimuli on the same side as such sounds. Exp Brain Res, 213(2-3), pp. 193–201. doi:10.1007/s00221-011-2742-8 . Cappelletti, M., Freeman, E.D. and Cipolotti, L. (2011). Numbers and time doubly dissociate. Neuropsychologia, 49(11), pp. 3078–3092. doi:10.1016/j.neuropsychologia.2011.07.014 . Cappelletti, M., Freeman, E.D. and Butterworth, B.L. (2011). Time processing in dyscalculia. Frontiers in Psychology, 2(Dec 2011), p. 364. doi:10.3389/fpsyg.2011.00364 . Cappelletti, M., Lee, H.L., Freeman, E.D. and Price, C.J. (2010). The role of right and left parietal lobes in the conceptual processing of numbers. J Cogn Neurosci, 22(2), pp. 331–346. doi:10.1162/jocn.2009.21246 . Cappelletti, M., Freeman, E.D. and Cipolotti, L. (2009). Dissociations and interactions between time, numerosity and space processing. Neuropsychologia, 47(13), pp. 2732–2748. doi:10.1016/j.neuropsychologia.2009.05.024 . Freeman, E. and Verghese, P. (2009). Peeling plaids apart: context counteracts cross-orientation contrast masking. PloS one, 4(12). doi:10.1371/journal.pone.0008123 . Freeman, E. and Driver, J. (2008). Voluntary control of long-range motion integration via selective attention to context. J Vis, 8(11), pp. 18–1822. doi:10.1167/8.11.18 . Freeman, E. and Driver, J. (2008). Direction of visual apparent motion driven solely by timing of a static sound. Curr Biol, 18(16), pp. 1262–1266. doi:10.1016/j.cub.2008.07.066 . Cappelletti, M., Freeman, E.D. and Cipolotti, L. (2007). The middle house or the middle floor: bisecting horizontal and vertical mental number lines in neglect. Neuropsychologia, 45(13), pp. 2989–3000. doi:10.1016/j.neuropsychologia.2007.05.014 . Freeman, E.D. and Driver, J. (2006). Subjective appearance of ambiguous structure-from-motion can be driven by objective switches of a separate less ambiguous context. Vision Res, 46(23), pp. 4007–4023. doi:10.1016/j.visres.2006.07.008 . Ruff, C.C., Blankenburg, F., Bjoertomt, O., Bestmann, S., Freeman, E., Haynes, J.-.D. … Driver, J. (2006). Concurrent TMS-fMRI and psychophysics reveal frontal influences on human retinotopic visual cortex. Curr Biol, 16(15), pp. 1479–1488. doi:10.1016/j.cub.2006.06.057 . Khoe, W., Freeman, E., Woldorff, M.G. and Mangun, G.R. (2006). Interactions between attention and perceptual grouping in human visual cortex. Brain Research, 1078(1), pp. 101–111. doi:10.1016/j.brainres.2005.12.083 . Freeman, E. and Driver, J. (2005). Task-dependent modulation of target-flanker lateral interactions in vision. Percept Psychophys, 67(4), pp. 624–637. Khoe, W., Freeman, E., Woldorff, M.G. and Mangun, G.R. (2004). Electrophysiological correlates of lateral interactions in human visual cortex. Vision Research, 44(14), pp. 1659–1673. doi:10.1016/j.visres.2004.02.011 . Freeman, E., Sagi, D. and Driver, J. (2004). Configuration-specific attentional modulation of flanker- -target lateral interactions. Perception, 33(2), pp. 181–194. Freeman, E., Driver, J., Sagi, D. and Zhaoping, L. (2003). Top-down modulation of lateral interactions in early vision: does attention affect integration of the whole or just perception of the parts? Curr Biol, 13(11), pp. 985–989. Freeman, E., Sagi, D. and Driver, J. (2001). Lateral interactions between targets and flankers in low-level vision depend on attention to the flankers. Nat Neurosci, 4(10), pp. 1032–1036. doi:10.1038/nn728 . Driver, J., Davis, G., Russell, C., Turatto, M. and Freeman, E. (2001). Segmentation, attention and phenomenal visual objects. Cognition, 80(1-2), pp. 61–95. Ipser, A., Karlinski, M. and Freeman, E.D. Correlation of individual differences in audiovisual asynchrony across stimuli and tasks: New constraints on temporal renormalization theory. , 2018. Fassnidge, C., Cecconi-Marcotti, C. and Freeman, E.D. Hearing through your eyes: the Visually-Evoked Auditory Response. , 2015. Freeman, E.D., Knudsen, S. and Fassnidge, C. Hearing through your eyes: modulation of the visually-evoked auditory response by transcranial electrical stimulation. , 2015.